In southwest Montana, Bozeman, gateway to Yellowstone National Park, is a four-season playground offering hiking, mountain biking, and fly-fishing in warm weather and ice-climbing, ice-fishing, and alpine and cross-country skiing when the snow flies. You’ll also find home-grown breweries and distilleries, fine restaurants with innovative farm-to-table dining, and stand-out attractions like Museum of the Rockies, a Smithsonian Institution affiliate, and The Ellen Theatre, presenting musicals, concerts and Wild West movies on its vintage stage (See Mighty Swell Bozeman, Montana). Bozeman also has more than its fair share of excellent hotels, from historic properties like the 1929 Baxter Hotel, with marble columns and wood-beamed ceilings, to newer luxury hotels like the Element by Westin with a pool, fitness room and greenery-filled patio. But nothing epitomizes the adventurous, outdoorsy spirit of the City of Bozeman and of the Great State of Montana better than The LARK. 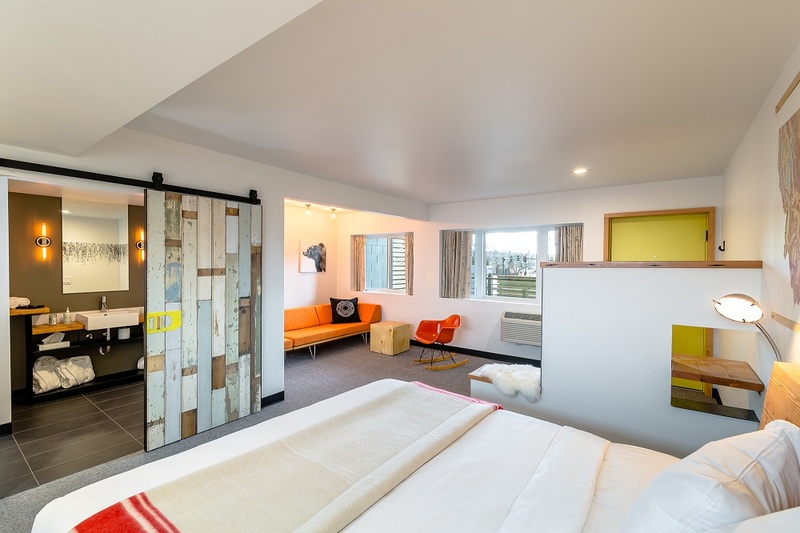 Opened in April 2015, on downtown’s shop-lined West Main Street, The LARK is one of the country’s new breed of “boutique-motels.” Renovated motels that flourished from the 1950s and ’60s, these reimagined boutique-motels first appeared in the late 1990s, say hospitality pundits. But, in the last five years, they seem to have reached critical mass. Like most other new boutique-motels, The LARK offers services associated with more upscale properties like laundry pick-up and concierge-like Guide service. You’ll also get friendly one-on-one attention from staffers. That’s not surprising considering The LARK is managed by Seattle-based Columbia Hospitality, known for running legendary properties like the the Knob Hill Inn in Sun Valley, Idaho , and, in Washington State, Snoqualmie’s Salish Lodge & Spa and Whidbey Island’s Inn at Langley. 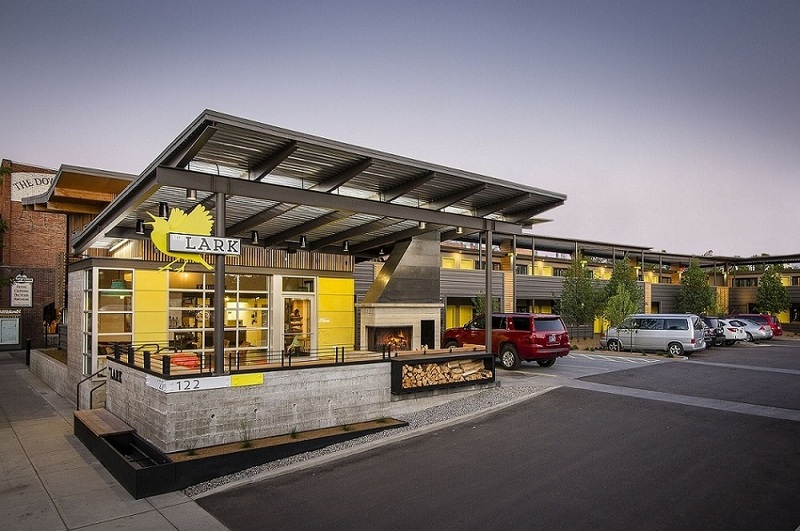 Arriving at The LARK after an easy 15-minute drive from Bozeman Yellowstone International Airport, you can’t miss the bright-yellow metal cutout of a cheery Western meadowlark, Montana’s state bird, hanging from the Lobby Building’s roof. Beneath it is an expansive patio with a wood-burning fire pit surrounded by neatly stacked wood. 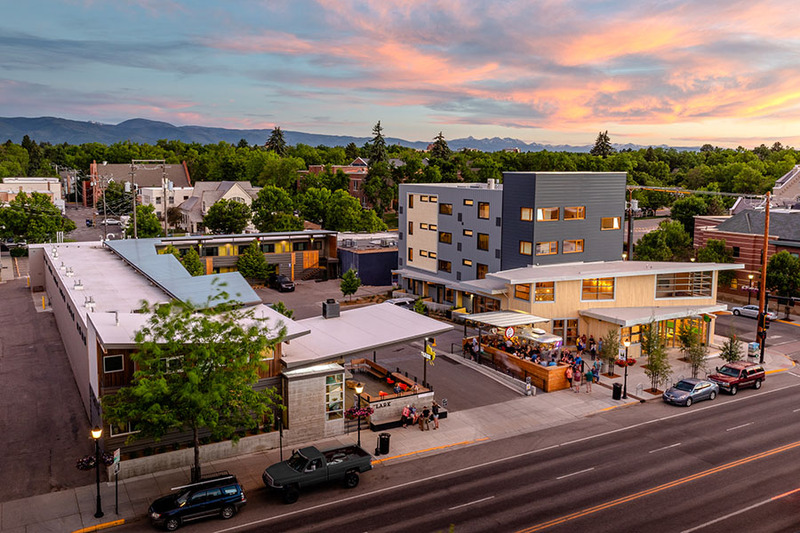 Designed to attract hotel guests and locals alike, the patio, a former carport, faces Bozeman’s Main Street, eight intriguing blocks of gourmet and gift shops, jewelry and Western-wear boutiques, and breweries and restaurants, not to mention two vintage theaters. Across from The LARK, White Dog Brewing Company, with an attractive red-brick taproom, sits alongside sister establishment Bozeman Spirits Distillery, which serves up stronger stuff like Montana 1889 Whiskey, Bobcat Gold Bourbon, Cold Spring Vodka, Ruby River Gin and Prairie Schooner Rum. Once you’ve arrived at The LARK, drive your rental car into the central motor court, and, if you don’t need help with your bags, pull right up to your room door and unload your gear. Later, a hotel employee will re-park your car in a nearby garage, leaving the motor court–which functions like a courtyard or plaza–open to hotel guests and locals. On the motor court’s other side, you’ll find an aluminum-clad vintage Spartan trailer, similar to an Airstream, serving ice cream cones and sundaes made by Bozeman’s own Genuine Ice Cream Co. Beside that is the café (and breakfast room) run by Treeline Coffee Roasters, yet another Bozeman culinary enterprise. If The LARK’s outdoor patio doesn’t remind you of a rustic Western lodge, the lobby certainly will with its comfy, gently worn, brown leather sofas, a weathered wooden sign giving directions to nearby cities and various other outdoorsy gewgaws. The lobby’s Map Room billed as “basecamp for your LARK experience,” has a long table, good lighting, and ceramics by Patrick Hoffman, a Bozeman Senior High art teacher. It’s an attractive spot to mingle with other guests while sipping coffee or the LARK’s own reverse-osmosis purified water. It’s also the perfect place to consult U.S. Geological Survey Maps, handy if you plan to do some hiking, climbing or backwoods exploring. Friendly staffers, known as LARK Guides, hover nearby. Some Guides provide expert advice on the great indoors, including Bozeman’s finest restaurants, breweries and distilleries, and most interesting museums and art galleries. They can tell you about local events like June’s BZN International Film Festival, August’s Sweet Pea Festival of the Arts or December’s Bozeman Ice Festival. And they always know what’s playing at The Ellen or The Rialto theater. 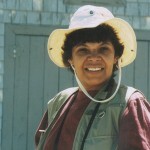 Other LARK Guides shepherd you through the great outdoors with inside tips on where to picnic, take a hike, see a waterfall, or go fly-fishing or mountain-biking. 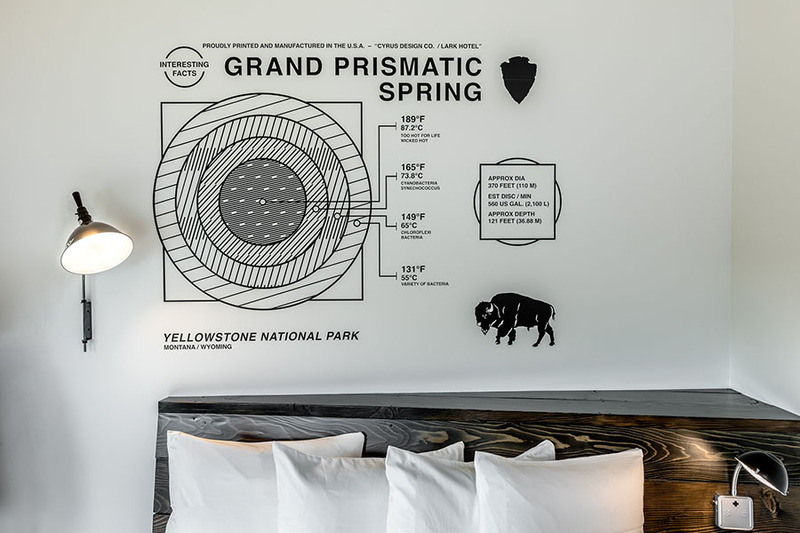 Whether you’re staying in or near Bozeman or heading farther afield to places like the Paradise Valley or Yellowstone National Park. It’s no accident that The LARK conveys such a strong sense of place. Architects Brian Caldwell and Erik Nelson met while students at Montana State University, on downtown Bozeman’s southern fringe, and founded THINKTANK DESIGN GROUP in Bozeman in 1999. From the outset, they intended to make The LARK a downtown hub while giving guests a sense of both Bozeman and greater Montana. Indeed, The LARK’s very location is steeped in local and state lore. Logging has long been a major Montana industry, and The LARK site once housed the Flanders & Lansing Lumberyard and, in 1904, the Kenyon-Noble Lumber Company. In the mid-1930s, this was the location of Crockett’s auto repair shop and gas station. Over the years, the site housed a bike-repair shop, a taxidermy studio, and an undertaker’s parlor. Finally, in 1963, an Imperial “400” Motel was built here. Founded in Los Angeles in 1959, the nationwide chain flourished for nearly three decades until 1987. Today, architecture buffs remember the motels for their iconic Streamline Moderne design, a Mid-Century Modern aesthetic with features like soaring “butterfly roofs”–echoed, perhaps, in the soaring roof now sheltering The LARK patio. In 2017, two years after The LARK opened, Caldwell and Nelson again demonstrated their sound ecological sensibilities when the West Building opened across from the Lobby Building. The new wing is constructed of cross-laminated timber. Popular in Europe, CLT panels are lightweight, durable and environmentally sustainable. To minimize the impact of noise on neighborhood businesses, as well as guests, the panels were assembled in Trier, Germany, then shipped to a staging area in Belgrade, 10 miles from the hotel. 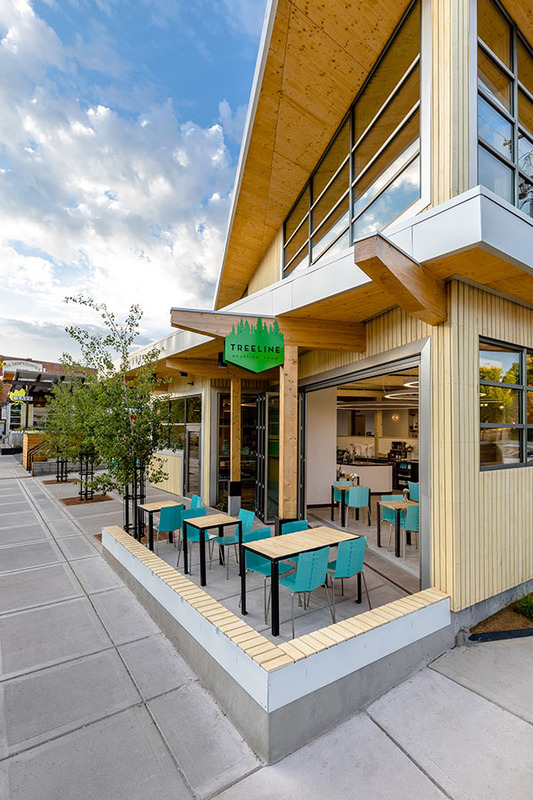 Besides creating a welcoming patio on Main Street, the architects found working with local gourmet enterprises like The Genuine Ice Cream Co. and Treeline Coffee Roasters was another way to build community and give guests an authentic taste of Bozeman. So, too, was the decision to partner with Bozeman’s Bridger Bowl ski resort, as well as local yoga studios, gyms, bike shops, and outdoor outfitters, to offer guests discounted rates and special overnight packages. Even the choice not to build a full-service restaurant was calculated to get guests out of their rooms and into Bozeman’s many fine eating and drinking establishments. Of course, The LARK’s rooms are actually quite appealing. Designed, in the architects’ words, for “comfort and convenience,” rooms are simple, spacious and well-appointed. White walls, with bright red, aquamarine and yellow accents, feature black-and-white graphics of state and local landscapes, weather and wildlife. These simple but striking “infographics” were all created by Bozeman-area artists, including local luminaries like the former art director at Museum of the Rockies. Your room might have an infographic comparing wingspans of Montana birds or lengths of native fish. Or, like mine, it might feature a circular map of local hiking trails radiating out from downtown Bozeman, including Montana State University’s famous “M Trail” through the nearby Bridger Mountains. With several room categories, The Lark accommodates virtually everyone. The Queen + Bunk has a Queen-sized bed for adults plus twin bunks for kids. The spacious Grand Avenue King, similar to a Junior Suite in other hotels, has a separate sitting area with a twin sleeper sofa. Introduced in summer 2019, and as big as all outdoors, the Rialto Suite has a King bed, twin sleeper -sofa and fully-stocked kitchenette. The basic floor plan includes several areas separated by low wall dividers. 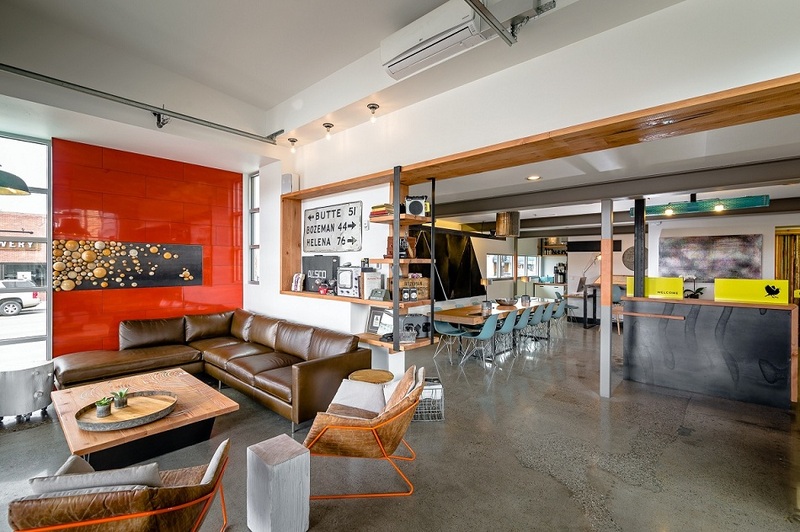 There’s a desk area with a simple wooden slab covered with local magazines like Montana Quarterly and Mountain Outlaw, a high-intensity reading lamp, and an orange molded Fiberglas chair like the famous Eames stacking chair, a Mid-Century Modern icon created in 1948. Beside that is a nook with one or two big comfortable beds with thick mattresses, good cotton sheets and heavy white wool blankets with red stripes that are reminiscent of Hudson’s Point Blankets but are actually Dutch Navy blankets. There are no in-room telephones, but you’ll find a 32-inch HD flatscreen TV with Google Chromecast as well as free Wi-Fi. A sliding barn door, an actual repurposed and weathered barn door, leads into an all-white bathroom, decorated with narrow white subway tiles and featuring a step-in shower and a white porcelain sink with a big unframed mirror. You’ll also find all-natural bath amenities by MALIN + GOETZ, founded by two young entrepreneurs in New York’s Chelsea neighborhood, and clever touches like a paint can that doubles as a trash bin. Simple but trendy, the decor might look as much East as West, as much big city as small town, but that dichotomy is the very essence of Bozeman. 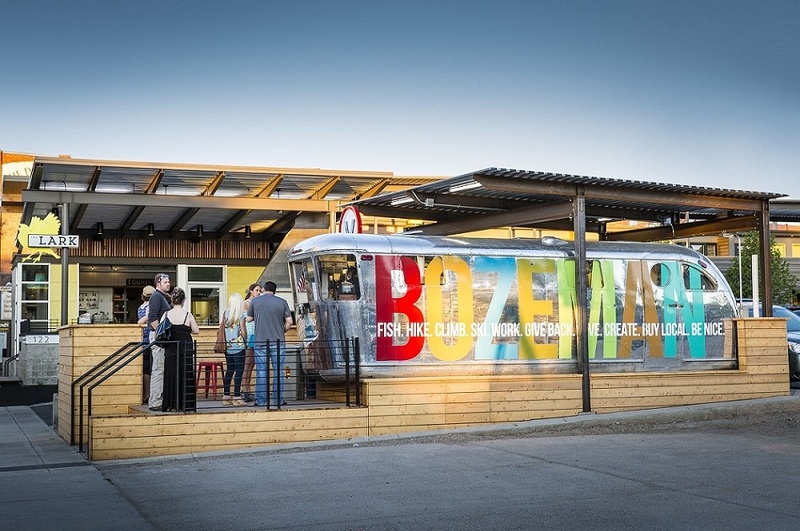 Though it looks and feels like a laid-back Western outpost, Bozeman is actually a small but sophisticated city attracting visitors from around the world. Quite a few Bozemanites, including restaurateurs and brewers, MSU professors and museum paleontologists, are transplants from larger Western cities, from elsewhere around the country, and beyond. One thing’s for sure, you’ll find even the simplest room at The LARK cozy enough to burrow into for a good long spell. Unless, of course, you’re tempted to escape all those creature comforts to explore the attractions of city and countryside.